What do you need to make a salad that’s filling, tasty, healthy, and non-boring? 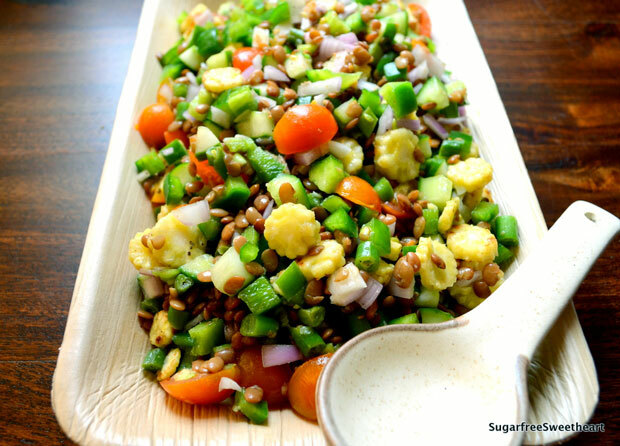 And so, here’s my happy horse gram salad that is simple, surprisingly tasty, and filling! It makes a great side dish with rotis or a satisfying snack. Horse gram is a legume that is a good source of iron and protein. Some studies indicate that it helps lower blood sugar levels and decrease insulin resistance. This gram is used in South Indian cooking, often combined with grated coconut and spices. Here, I’ve used it in a salad with a simple lemon “vinaigrette” dressing which I think worked pretty well! This recipe is suitable for diabetics, weight watchers, and those not averse to horsing around (bwah ha ha)! Horse gram is stubborn (maybe it should be called Mule gram :P). Expect it to take anywhere from 15 – 20 whistles in your pressure cooker. A fantastic, rich & colourful plate of lovely food! I made it today & it was so tasty & apart! I served it with red lentils & it was superb! Priya, I read this earlier, and asmI was preparing dinner tonight (which was salad), I was thinking of your elements for a great salad. I have to agree, when you’ve got one of each of those ingredients, your salad will rock! PS – what is horse gram? I have never heard of it, unless I know it by a different name? Thanks Sophia. I think horse gram is not used much outside India. Here it’s also called kulith, kollu, huruli, muthira, or uluvala. I think French puy lentils taste similar and have the same kind of firmness when cooked. Great to know! Thanks Priya! I love your salad making “rules”! 🙂 And thanks for introducing us to horse gram. I never knew about it! Can I get it from any grocery store? Thanks Priya! I’m not sure horse gram is used much outside India. Maybe a decent sized Indian store in your area stocks some? From what I’ve tasted, I think French puy lentils would make a good substitute in a salad of this kind. Hi Priya! I like your question! I love filling and healthy and flavorful salads! I’ve never tried horse gram, but that sounds like a lovely legume kind. I look forward to reading more of your posts including South Indian cooking! A lemon vinaigrette sounds wonderful and refreshing, plus I love adding shallots with the lemon juice for a bit more refined taste. Thank you for sharing such an awesome vegan recipe. I have never heard of horse gram but the salad looks great. Try out my recipes. Will definitely check out your blog! Thanks for the comment. I think horse gram is not used much outside of India. You could use puy lentils to get the same effect. I’ve never heard of horse gram! But your salad looks wonderful, and I especially like your “formula” for making salads. I’ll have to keep an eye out for horse gram…. Thanks Lucy. Horse gram is a bit rare outside India, I think. Perhaps an Indian store in your area will have some? You can substitute any other firm lentil like the French puy Lentils for this recipe! Yum! Boy, do I love my salads….. A lot:). I loved the way you wrote this up;). Horse gram is masoor dal.. Right? Or moth? Horse gram is kulith or kulthi. It’s similar to moth biologically, apparently.